So, CorgiHat went live while I was at MomoCon, which is why the announcement for this is a little belated. 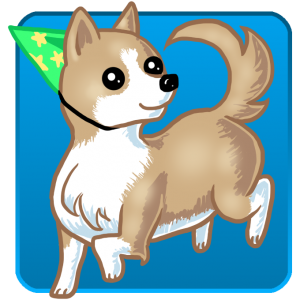 You’re still completely welcome to sign up for the CorgiHat Beta group, as we’re going to be improving the app and launching other apps over the next several months. For now, though, we’re taking a bit of a break to get caught up on personal stuff and plan the next iteration of the product. I also completely forgot to mention that Bodies Are Disgusting is now available on Google Play! It took a little while for me to iron everything out, and to celebrate, the book is free until 6/6/14 on Google Play only! In silly news, I realized that yesterday was the third anniversary of Alonso Munich’s death! Happy death day to him. :D I’m very excited about his story and hope that I can share some more of it with you all soon. As I’ve mentioned before, my father and I have been working together on an Android application we’ve dubbed CorgiHat. It’s been a labor of love for about the past six months, but we’re finally coming into the home stretch, where we’ll have something tangible to show to the world. To celebrate this, we’ve created our first User Experience Survey over on Google forms. If you are an artist/artisan who does commission-based work, it would mean a lot to us if you could spend a few minutes to fill out our survey. None of your information will be shared with third parties, all of the fields are optional, and the only purpose your responses will be used for is to make our application better. CorgiHat Development Blog Now Open! We’re really excited to be working on this project and I hope that you will join us on our journey to create a wonderful suite of applications.